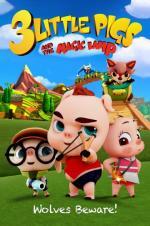 Buy or Rent 3 LIttle Pigs and the Magic Lamp (2016) Movie DVD & BluRay Online! Movie Plot: Three little pigs, Melanie, Danny, and Bobby, are best friends and longing for adventure. One day they find a treasure map which could lead them to the mysterious magic lamp unlocking the mystery and secrets of the forest. Along the way in their quest the pigs encounter the original owners of the treasure map, the evil wolves who want it back. Everyone knows that whoever holds the magic lamp can rule the forest so it is a race for the pigs to use their courage, brains and heart to find the lamp and save their school in this adventure of good versus evil.